I love the soft feel of the fabric. It is rich and full. This is a great blackout curtain. I got the geometry but was hoping to find it in a pleat Or a rod and pocket in order to use a traverse rod. I will definitely recommend this to a friend. Find the perfect combination of fashion and function with the Eclipse Newport Blackout Curtains. 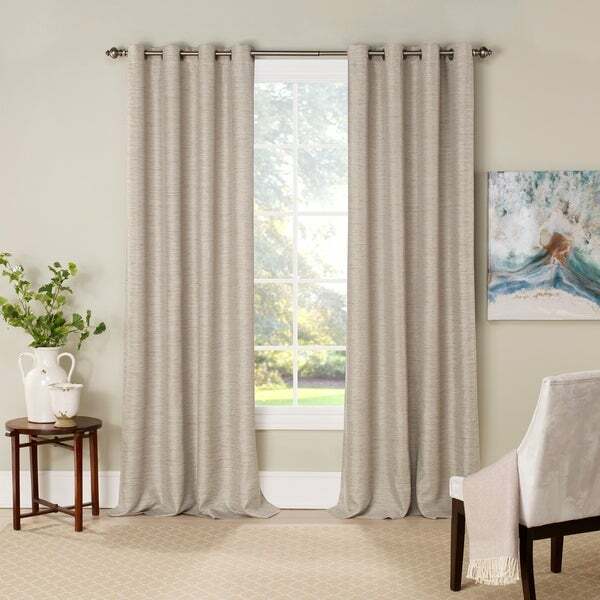 Eclipse offers a complete line of functional curtains that provide privacy, manage light, reduce noise, and help with energy savings, without sacrificing the latest looks in window fashion. These beautiful panels offer blackout benefits and feature a jacquard textured solid. Premium thermal lining gives this panel a rich hand and provides luxurious drapability. Each panel measures 52 inches wide in your choice of 63, 84, 95, or 108 inches long. 1.65 inch brushed nickel grommets are recommended with a 1 inch rod for maximum movement. Curtain rod sold separately. 100% Polyester, lined panel. Machine washable. The color and the texture are very good. They are indeed black out curtains. I think they will be great winter insulation. I really like the them. The curtains hang nice and look nice but don't block out all the light. This curtain provides the right amount of blackout filtering for my guest room. It also coordinates with a sliding door counterpart. It is perfect with the natural decor.